This lovely lady may seem familiar to you, and that’s because we mentioned her in a previous article about her 1 year anniversary with 1905 Catering. As a member of the small, cosy 1905 team, she plays a big role in preparing for catering orders. She’s also a massive help with the Cafe. We chatted to Catherine about her experience working here! I’ve worked in hospitality for quite a few years now. I started off working with my mum at an old cottage cafe in Middle Swan for a few years, and then at the Café D’Vine in Midland. I still help her out with food preparation and waitressing on my days off. I joined the 1905 team in early March last year. At this time we were based on Newcastle Street and called 1905 Coffee on Newcastle. I enjoyed working in the cosy cafe setting and interacting with new customers everyday. My manager, Julie Burnett, taught the team different techniques and basic recipes. I use these to create sauces and marinades that make up our delicious, fresh food. 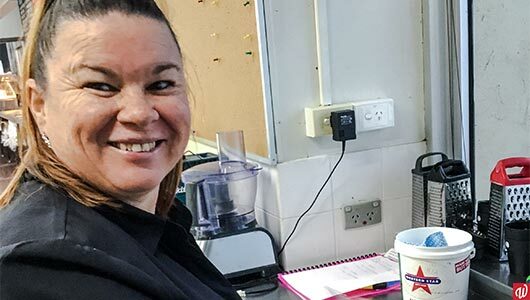 When the opportunity came up to work from the WAPOL Headquarters, I was keen to continue to stay on and gain hospitality experience in a new setting. When I’m not working at the Cafe, I like to keep busy and do my part for the community. I work at the cafe on Mondays and Thursdays, and volunteer at the local Returned and Services League of Australia (RSL) on Wednesdays. I used to help the RSL with small packaging jobs and administrative tasks. In the past I’ve also volunteered my time to do sewing and sorting jobs. I like to try new things and broaden my skills. I always look forward to going to work. Working at 1905 Catering is really rewarding – we have a great, supportive team and work well together. We always have fun and keep things positive. I enjoy working in the larger kitchen and being able to help out with catering orders and other cafe duties. In the future, I’d like to take on more responsibility to manage orders, and maybe develop my culinary skills through study. Our social enterprises like 1905 Catering provide meaningful employment for many people with disability. Find out more about the opportunities available to you by contacting us here or calling 1800 610 665.